Your one source supplier for all your water, sewer and storm supply needs. 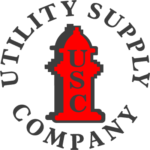 Founded in 1962 under the principle that you cannot sell from an empty cart, Utility Supply Company is a Family Owned Business that believes in an extensive inventory to meet our customer’s everchanging needs. With locations positioned North to South across the state we strive to be your one stop Water, Sewer and Storm Water supplier. Utility Supply Company is well positioned geographically to supply quality underground supplies throughout the entire state and surrounding area. Utility Supply Company is known for its large inventory and quick delivery, and is the home of the hard to find part. Material other distributors won’t stock, we do. Our sales people drive pickup trucks. Why? So they can help deliver smaller parts in our effort to provide the best possible customer service. We maintain a fleet of over 20 delivery trucks that allow us to deliver supplies when they are needed. Our four full service locations are staffed with knowledgeable and experienced sales and delivery personnel. Utility Supply Company distributes products from the leading manufacturers in the water and sewer industry. Utility Supply Company has a Team of Neptune meter specialists dedicated to this product line. Click the button below to view all of the products we offer. At Utility Supply Company our highest priority is our customer, which is why we value face-to-face customer service above all else.